The Custom Cost functionality allows you to modify your AWS bill in order to fulfill multiple use cases. Amortize RI purchases across hourly usage so you can bill internal or external parties for their RI usage, including the RI upfront costs, accurately. Create bills for one or more AWS payees that reflect the stand-alone AWS costs. Modify usage rates and adding custom charges. The configuration options determine how CloudCheckr builds a custom cost. If you change these options, you may need to reload the Detailed Billing Report (DBR). From the left navigation pane, choose Cost > AWS Partner Tools > Configure > Configure Custom Cost. The Configure Custom Cost page opens. Modify the configuration options as needed. Unblended Cost: keeps the cost for on-demand and RIs separate. Blended Cost: average of rates for Reserved Instances (RIs) and on-demand instances. None: No RI amortization will be enabled. 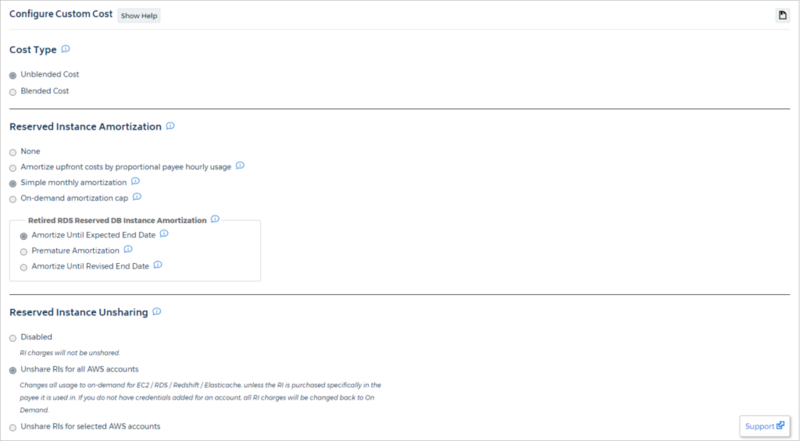 If you select None, the Retired RDS Reserved DB Instance Amortization section will no longer be avaiable for modification. Amortize upfront costs by proportional payee hourly usage: Adds amortization as an incremental charge for every hour an instance is used that matches an RI. Simple monthly amortization: Adds amortization as a single charge per RI type at the end of the month. On-demand amortization cap: Adds amortization to each usage row up until the on-demand cost of the running instance. Any remaining amortization is charged back to the account that purchased the reserved instance. Amortize Until Expected End Date: calculate amortization according to the original end date for the RI. Premature Amortization: if an RI is retired before the original end date, apply all of the remaining amortization to the last month of an RI's term. Amortize Until Revised End Date: calculate amortization to the new revised end date. No amortization calculations are needed after this new end date. To change the end date of an RI, from the left navigation pane, choose AWS Partner Tools > Configure > Retired RDS Reserved DB Instances. AWS allows consolidated billing families to share RIs. CloudCheckr can unshare these RIs in order to provide a custom cost that allows you to only bill individual accounts for the actual on-demand usage. To enable unsharing, select Unblended Cost from the Cost Type section. Disabled: This is the default setting. RI charges will not be unshared, i.e. everything will appear as it does in the AWS bill. Unshare RIs for all AWS accounts: RIs will be unshared and any accounts that were previously taking advantage of another?s discounted pricing will now see on-demand pricing. Changes all usage to on-demand for EC2/RDS/Redshift/Elasticache, unless the RI is purchased specifically in the payee it is used in. If you do not have credentials added for an account, all RI charges will be changed back to on-demand. Unshare RIs for selected AWS accounts: Choose the specific accounts to have RI Unsharing. Unshare RIs for credentialed AWS accounts: If you do not have credentials added for an account, the RI charges for that account will not be re-calculated and will match the costs within the AWS Detailed Billing Report. Use this feature to adjust any RI volume discounts to reflect the purchases for any account family. This feature reverses any RI volume discounts that are given for the consolidated billing family but may not be due for the account family. This feature will give the volume discounts if the account family meets the volume discount levels. For more details, see Amazon EC2 Standard Reserved Instance Volume Discounts. AWS creates tiered pricing across consolidated billing families. When this feature is enabled, CloudCheckr can uncompress these pricing tiers to provide a more accurate custom cost to ensure that individual accounts will not gain any unintentional discounts. Once you have configured your custom cost, reload the DBR so that the custom cost can modify any historical months. The default setup is configured to create a list cost where all your payee accounts will be billed as if they are going directly and independently to AWS for their services. As a result, a managed services provider (MSP), which may have multiple AWS accounts they can leverage to get volume and tiered discounts, can control if those discounts get passed onto their customers. You can use custom cost to enable hourly amortization so that any RI within your consolidated billing family will only get billed the part of the RI upfront cost that is proportional to their usage. The amortized amount will be added to their incremental hourly usage. Enforce EC2 Standard Reserved Instance Volume Discounts on Account Families: If you use account families and you want the account families to earn their own RI volume discounts, select Enabled. Otherwise, select Disabled.